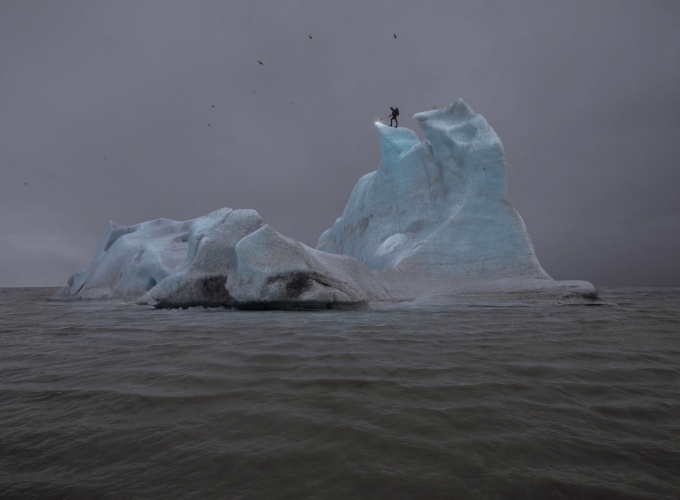 July 25, 2016 – Sean Kelly is delighted to present Freeze, Memory, an exhibition of recent work by Berlin-based, Swiss artist Julian Charrière. 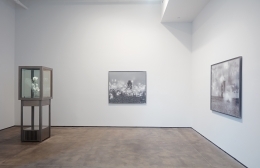 This will be Charrière’s first exhibition in New York and his first exhibition with Sean Kelly. An opening reception will take place on Saturday, September 10 from 6:00 to 8:00pm, and the artist will be present. 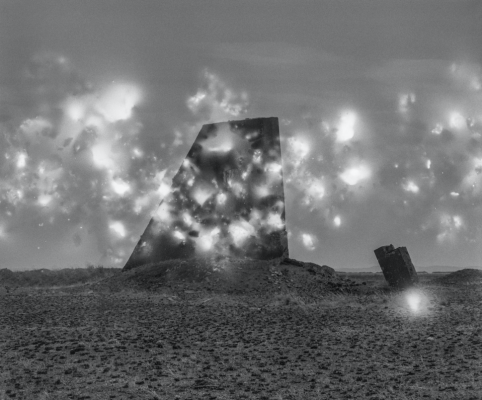 Freeze, Memory will present three different bodies of Charrière’s work together for the first time, each exploring how human civilization and the natural landscape are inextricably linked. 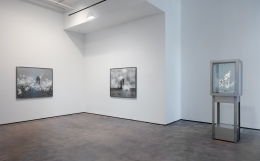 In the front gallery space, Charriere’s photographic series entitled Polygon will be on view. Inspired by J.G. 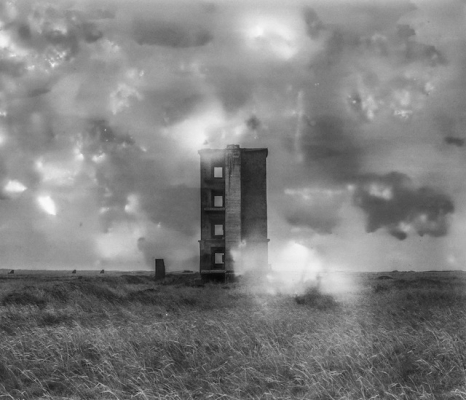 Ballard’s science fiction short story The Terminal Beach, the artist travelled to Semipalatinsk, Kazakhstan, the primary nuclear testing site for the Soviet Union. 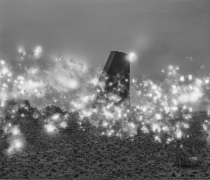 Shot on medium format film, Charriere exposed the negatives to radioactive soil gathered from the area, also known as "The Nuclear Polygon," before developing them. 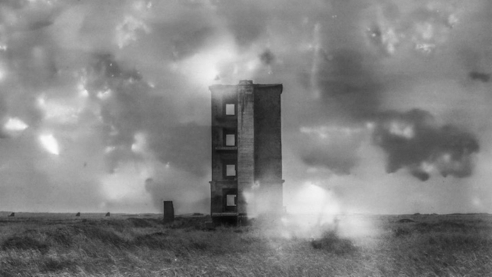 These hauntingly beautiful images evoke ghosts of the area’s nuclear past, whilst also revealing one the most remote and inaccessible locations on the planet. The Polygon works will be juxtaposed alongside pieces from Charrière’s Tropisme series. 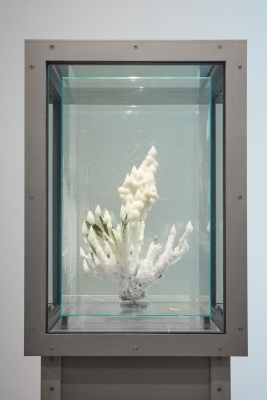 In this body of work, the artist has taken ferns, orchids and various succulents, plants known to have existed 65 million years ago during the Cretaceous period, and dipped them in liquid nitrogen. Shock-frozen at -196 degrees centigrade, the plants are then displayed in sealed glass vitrines and kept refrigerated at -20 degrees centigrade, transforming them from ordinary houseplants into delicate "living fossils." 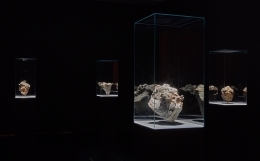 Preserved indefinitely in a state between life and death, the works represent an interface between the past and the future and address ideas about ephemerality, the passage of time, and humankind’s attempts to dominate the environment. 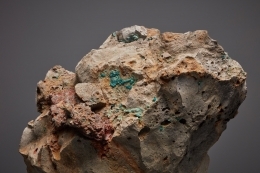 Charrière’s most recent series, titled Metamorphism, will transform the downstairs gallery space into a cabinet of geological curiosities. 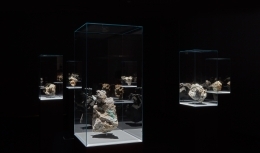 Displayed in vitrines like topological fragments from a futuristic natural history museum, Charrière has melted down the internal elements from various technological devices (main boards, hard drives, CPUs, RAMs, etc. from laptop computers and smartphones) with molten lava, returning them to their geological origins. 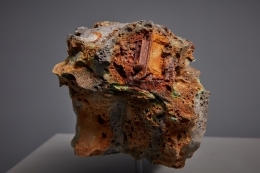 Beautiful aesthetic objects in their own right, these magnificent polychromatic sculptures reflect upon the mining and use of raw materials and the future of our civilization’s artificial by-products. 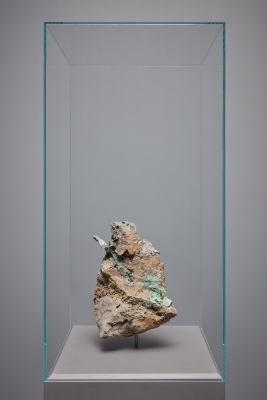 “The precious metals contained in these sculptural stones—the ecologically problematic and economically contro-versial basis of our digital world—are mined in the furthest reaches of the Earth, and ultimately have been re-turned in Charrière’s metaphorical transformation process to their original form.“ (Julia Brennacher, “Living in The Anthopocene,” in The Forces Behind the Forms: – Geology, Matter, Process in Contemporary Art, Cologne: Snoeck. Germany. 2016). Born in Morges, Switzerland in 1987, Julian Charrière currently lives and works in Berlin. A former student of Olafur Eliasson and participant of the Institut für Raumexperimente (Institute for Spatial Experiments), Charriere has exhibited his work – both individually and as a part of the collective Das Numen – at museums and in-stitutions worldwide, including the Parasol Unit Foundation for Art in London, Musée des Beaux-Arts de Lau-sanne in Switzerland, Centre Culturel Suisse in Paris, Haus der Kulturen der Welt in Berlin, Kunsthalle Wien in Vienna, Thyssen Bornemizsa Art Contemporary in Vienna, Neue Nationalgalerie in Berlin, The Reykjavik Art Museum in Iceland and at the Museum of Contemporary Art in Tokyo. In 2012, Charrière collaborated with the artist Julius von Bismarck on the site specific performance piece Some Pigeons Are More Equal Than Others for the 13th International Architecture Exhibition – La Biennale di Venezia. 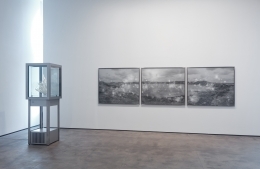 Charriere was awarded the Kiefer Hablitzel Award / Swiss Art Award in both 2013 and 2015.